“The Fourth Republic is almost 16 years old, we are happy it has not been interrupted and by God’s grace it would never be interrupted, but it’s high time Nigerians realised that we alone can build our democracy by doing away with sentiments. Electorates should vote not based on religion, geo-political regions and certainly not for stomach infrastructure, but what an aspiring leader has to offer“. In our dear country it is not uncommon to hear expressions like “God will judge you” or “fear God” on a daily basis. What both expressions have in common is that the party who uttered those words is most likely in a helpless situation and resorts to divine intervention or should I say puts the situation in God’s hands. And the party at the receiving end of the expression is often times not remorseful, as he well knows that God’s judgment would not be delivered at that instance. At the risk of contradicting the the late Afrobeat legend and human rights activist Fela Anikulapo Kuti, my people only fear what they see, we fear only that which is certain and disregard any form of uncertainty with expressions like “nothing would happen”. The 2010 census of the Association of religion Data Analysis (ARDA), a source of online information on religions worldwide, reported that 46.5 per cent of Nigeria’s total population is Christian, 45.5 per cent Muslim and 7.7 per cent are members of other religious groups. This numbers show that virtually all Nigerians belong to a religious group, and as we all know some even belong to more than one group. Religion in Nigeria has never been taken for granted, it was not taken for granted upon the Independence of this great nation in 1960 and it still isn’t taken for granted till this day. Individually majority of the 170 million citizens take their religion so seriously that it transcends all aspects of their lives, be it at the office, place of business, in academics and of course in politics. This is the Nigerian way as everyone needs the grace of God to survive in this tough clime. Since the commencement of the Fourth Republic in 1999, great tales have followed the emergence of some those who have ruled us. Former military ruler, Chief Olusegun Obasanjo who was released from prison barely a year before, went on to win the presidential elections held on February 27th, 1999 with 18,738,154 votes representing 62. 78 per cent of the votes casted and was sworn in as the President on May 29th, 1999. He handed over to his successor the late president Umaru Musa Yar’Adua after serving the maximum two terms. Unfortunately the late President could not complete a term of four years in office as he passed away on May 5th 2010 after a long illness. The Vice-President at the time, Dr Goodluck Ebele Jonathan was sworn in as an acting president on May 6th, 2010. His rise to the position of the number one citizen of the country was rather unusual, as he had never contested for a political office as the major flag bearer but always as a running mate. That soon changed as President Jonathan won the April 16th, 2011 elections polling a total of 22,495,187 votes representing 58.89 per cent of the votes casted. The tales of the rise of both President Olusegun Obasanjo and President Goodluck Jonathan are nothing short of miraculous and Nigerians would often say they were brought to power by God. 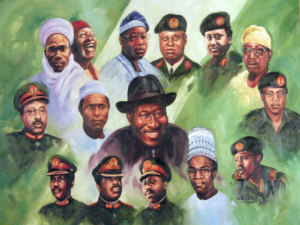 The heroes of these great tales and their cronies also often remind Nigerians of how God brought them to power and how God would steer us clear of whatever crises we are going through at that particular time, I beg to differ. I pondered on this assertion for a while, I said to myself “where I come from, a leader that attributes his ascension to a leadership position to God is thought to be humble and this is seen as a good thing, now this former Mayor of New York is suggesting otherwise”. The flip side is, when a leader has the mind-set that he was ordained by God rather than voted in by the people, such a leader might start to get complacent, after all if he believes he was brought to power by God, he must at some point feel (whether consciously or subconsciously) that he isn’t accountable to the people, a very convenient stance for politicians to take. Our leaders should always see governance as a social contract and realise that they owe the people a duty to perform honestly and effectively during their time in public office. They must realise that they remain accountable to the people, the “people” here being you and I, the ordinary Nigerians, and not only to the cabals and power brokers that they pay allegiance to, after all the members of the cabals and power brokers barely constitute 1 per cent of the nation’s population. They should also never forget that it is the votes of the people that brought them into power, a statement like “I thank God that you the people voted for me and I’m happy to serve you” should be the guiding principle throughout the tenure elected for and not just one made during the acceptance or swearing in speech. One may be forced to ask, “How can all these be achieved?” “How can a leader with so much power at his disposal still feel accountable to the ordinary Nigerian?” It’s simple, we make them fear that which is certain, that is if they fail to be anything short of effective, honest and accountable in the first term, such a government would be voted out in the next elections. Nothing scares a government more than the thought of its political opponents winning the next elections and thus taking over power. I would give an example that cannot be disputed, the result of the June 21, 2014 Ekiti governorship election sent shockwaves through Nigeria’s political atmosphere, and the major opposition party in the country, the All Progressives Congress was at the receiving end of a large part of the shockwave, the party which the incumbent Governor belonged to had just lost a state in the South West geopolitical region, believed to be one of its major strongholds. Much was said of the heavy deployment of security forces and the intimidation of members of the APC during the elections, allegations which have since been confirmed to be true, but the party still did not ignore yearnings that it might have lost the election due to the government’s anti-people policies. The APC reacted swiftly by reversing some policies in states that it controlled in the south west, barely two months after the shocking result of that election, the Lagos State Government on the 7th of August 2014 announced the reversal of the Lagos State University (LASU) fee to the old rate of N25,000, its counterpart the Ogun State Government also reduced the fee for students of Olabisi Onabanjo University. Also the Edo State Government cancelled the much lauded teacher’s competency test which had exposed the decadence in the state’s education sector but had in turn made the government quite unpopular. This is how the political class reacts when they fear the certainty of being voted out, it’s one of the beauties of democracy, and no political group should ever believe it has the monopoly to govern an area or constituency, it gives room for complacency and in turn mediocrity in governance which never favours the constituents. We all remember when MTN and Econet Wireless claimed their facilities could not support the per second billing system, and then our very own Globacom Limited introduced it upon commencement of its operations in 2003. What seemed impossible had been achieved, and the South African multinationals knowing fully well that they would lose subscribers to the new market entrant, reacted swiftly by introducing the system to its subscribers. The advantages of competition in a market system are endless, just as it is in democracy too, in fact the great democracies of this world got to where they are today due to the competition amongst their major political parties. The purely issue based politics and criticisms of policies between the Democrats and the Republicans in the United States of America never stops just as it is between the Conservatives and the Labour party in the United Kingdom. The Fourth Republic is almost 16 years old, we are happy it has not been interrupted and by God’s grace it would never be interrupted, but it’s high time Nigerians realised that we alone can build our democracy by doing away with sentiments. Electorates should vote not based on religion, geo-political regions and certainly not for stomach infrastructure, but what an aspiring leader has to offer. We must learn to adopt issue based politics because that is the only way effective, honest and accountable leaders emerge and issues of national concern get solved. Great leaders hardly emerge by luck or chance, neither do national issues get solved by relying on divine intervention. As we head for the polls in February 14, 2015 to choose whoever would lead this great nation for the next four years, I do hope we finally get it right. I hope a leader who feels accountable to the people is chosen, not one that believes otherwise since he was ordained by the Supreme Being, and lastly one who does not owe his allegiance to the cabals and the power brokers who constitute less than 1 per cent of the nation’s population, to the detriment of the remaining 99 per cent. ← Nigeria’s oil price slump, a blessing after all!